Gabrielle Utton blogs at The Green Gal, where she talks about living in the country, treading lightly upon the earth and making beautiful things. Following her participation in the This is What Frugal Looks Like series, I received numerous requests for her natural beauty recipes! She was kind enough to share some favorites. Melt one teaspoon (tsp) castor oil, one tsp coconut oil and one tsp grated beeswax in a bowl over a pan of simmering water (this is called a bain-marie or double boiler). Once melted pour into an empty clean lip balm pot. You can add a couple of drops of your favourite essential oil to give the balm some flavour – peppermint’s a favourite of mine. Pour 40ml castor oil, 40ml rapeseed oil and 40ml olive oil into a bottle. Shake well and there you have it! It removes waterproof mascara and moisturises your eyelashes at the same time. Once you’ve used this you’ll never want to go back to shop bought. Pour six tablespoons (tbsp) granulated (or coarse) sugar into a bowl and add 3tbsps almond oil. Mix well and add a few drops of your favourite essential oil. Pour into a jar and use next time you bathe. Just be careful getting out of the bath or shower as the oil can make surfaces slippery. I hope you find these simple recipes useful. A quick search on the internet will throw up many more recipes, a lot of the time it’s just trial and error to get a formula that works for you. Do please remember that I am not a pharmacist, these recipes have only been tested on me so I am not responsible for how the products you make react to your skin. I’m going to make the sugar body scrub- at least it’s on my list of things to do today! Hmm–I really like the idea of the lip balm and will have to try it. I recently made my own deodorant and am reasonably happy with it but will probably change the recipe. I actually use coconut oil now to moisturize my hair, face and body–no mixing required. I think there is something to be said for making your own. I’d also love to make my own soap but am waiting for a well-ventilated area because of the lye. . .
.-= Simple in France´s last blog ..How do you chose a ‘new’ car? =-. Care to share the deodorant recipe? 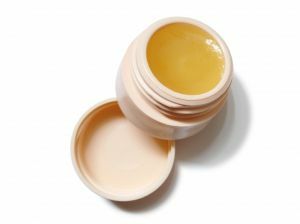 I never thought it was that easy to make lip balm, have you ever experimented by putting sunscreen in it? I hate paying 20$ for a tube of lip balm with sunscreen! I don’t know if actually putting sunscreen in it would work, but using some kind of blocking agent might work as sunscreens work either with the principle of creating a chemical barrier between your skin and the sun or a physical barrier (which was why lifeguards used to put zinc oxyide on their noses!). On the other hand, I would not want to mess around with my health by experimenting with sun protection. Instead, I buy a cheaper sunscreen / lotion with a lower SPF and apply it much more liberally and more often then recommended- most people don’t put nearly enough sunscreen on! I’m totally making more and more of my beauty products and finding that I’m so much happier with them than I ever have been with commercial products. Plus I feels so much more peace because I know exactly what is in the products I make and use. I believe more than ever that if you wouldn’t eat it, you shouldn’t put it on your skin. It’s not just what we do to the environment; it’s what we do to our biological selves.